LONDON -- People died in a massive fire that raced through a high-rise apartment building in west London early Wednesday, London's fire commissioner said, though she could not say how many. At least 30 people were sent to hospitals. Flames shot from windows all the way up the side of the 24-story Grenfell Tower in North Kensington as firefighters battled the blaze, and a plume of smoke could be seen for several miles. The cause of the fire was not immediately known. Residents said it appeared to start in an apartment on a lower floor and spread upward quickly. People at the scene spoke of being unable to reach friends and family who had been inside. Others said they could see people inside using flashlights and mobile phones to try to signal for help from higher floors. Fire Commissioner Dany Cotton called it an "unprecedented incident" unlike anything she had seen in her 29-year career as a firefighter. She said there were "a number" of fatalities. The blaze started around 1 a.m. London time, and smoke was still pouring from the building hours later. Others searched for information at makeshift centers set up at churches and recreation centers. At St. Clement's Church, where evacuees from neighboring buildings gathered, Hadra Hassad was trying to find one of her closest friends, who lived on the 21st floor. Hassad says she believes one of her friend's daughters is in the hospital, but didn't know which one. Ambulances and fire trucks filled the streets around the building, which is located in a diverse, working class area of London. People who live nearby were evacuated, some carrying pets in their arms as they left. Volunteers handed out bottled water. Helicopters hovered overhead and smoke hung over the scene. Exhausted firefighters sprawled on the pavement just inside the police cordon, drinking water from plastic bottles. 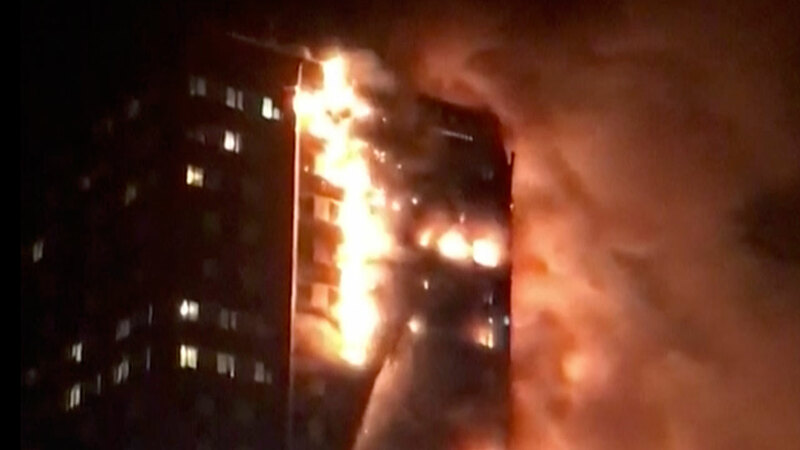 The London Fire Brigade said 45 fire engines and 200 firefighters were called to the scene. Assistant Fire Commissioner Dan Daly said it was a large and very serious incident. George Clarke told Radio 5 Live that he was covered in ash even though he was 100 meters (yards) from the scene.